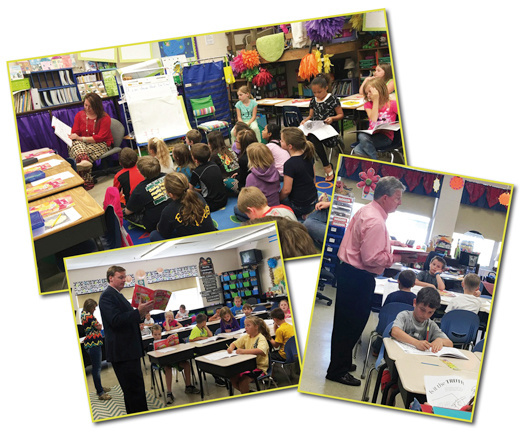 The Rotary Club of Zanesville (Ohio) Daybreak, USA used the book entitled "Andy and Elmer's Apple Dumpling Adventure" to help spread the word of the Rotary Four Way Test to area second grade students. The concept was that if we could get our young people to use and think about the Rotary Four Way Test, their knowledge would then help to bring peace to their person, classroom, school and home. The days activities included Rotary Volunteers (Rotarians, Interacters and Community members) reading the Andy and Elmer book to about 600+ second grade students. Each class received a book and lesson plan that the teacher could keep, a Four Way Test poster, and an Andy and Elmer activity book and Peace Sticker for each student. In addition, after the reading exercise, we had a 20 minute assembly. The assembly was put on by a young man who played Johnny Appleseed. During his presentation, he not only taught the students about who Johnny Appleseed was, but he then used the course materials to reinforce the Four Way Test to the students and how they could use it in their everyday lives. The project then culminated with the planting of an Apple (Peace) tree on the school grounds. In addition, there were three other trees planted in local community gardens. The other really cool part of the project was that Rotarians and Rotaract students collected apple themed nonperishable food items during that week of International Day of Peace to donate to a local food pantry. We were able to provide over 75 items!!! 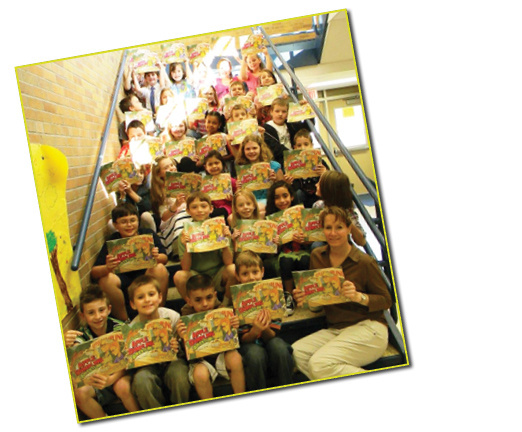 The Andy and Elmer book was printed and made possible by the Fairborn Rotary Club of Fairborn, Ohio USA. I was introduced to their project during a session at last years Rotary International convention in Atlanta. We had Five volunteers at Boulder Bluff Elementary School for the Andy & Elmer Literacy Project. Thank you Pearl DeLain, Clifford Chatman, Steve Sabback, Vera Washington & Deb Walworth for taking time to read to the second grade students. In the next few weeks we will be reading and distributing books at Westview Primary School, Howe Hall AIMS and Marrington Elementary Schools. We will be reading to students and giving close to 500 students a copy of the book. This is actually the second time we have ordered your wonderful book. About 10 or so years ago, we purchased 200-300, don't remember the exact number, to place a copy in the hands of every school library in our county, a copy for every third grade student. Similar to the dictionary project of today. As an aside, I personally have used my copy to read to elementary students several times a year as a reader in our club's literacy project, ongoing for several years now. I always include a short talk to the students about entrepreneurship and about what Rotary is and who Rotarians are and what we stand for. These 100 books are part of our current literacy project and a copy will be placed in a Christmas package for 100 needy families. Our members will assist the local Jr. Auxiliary club in assembling the packages. Our club is the R.C. of Louisville MS., a member of District 6820. I am John Fair, a PDG having served proudly as a Centennial Governor for D6820 in 2004-2005. But the credit belongs to our rookie member Brooke Eaves, Chairman of our Community Service Committee, and current President Johnny Snow, who has increased our club membership by 20% already this year. Please forgive me for bragging, but I am SO proud of our club and our current club leaders. And my congratulations to the Fairborn Rotary Club for continuing their wonderful project of making the Apple Dumpling story books available. More clubs need to be made aware of your project as this book and the corresponding coloring book exemplify the highest ideals of Rotary AND a wonderful introduction to entrepreneurship! We wish you our Rotary best. 2016 Literacy Project! 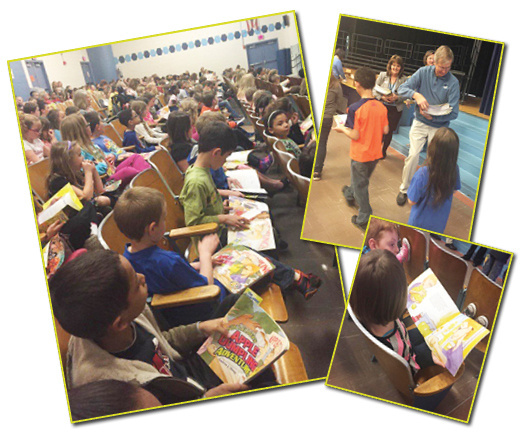 Every 2nd Grader in Greene County was gifted an Andy & Elmer Activity & Storybook with bookmark. Rotarians visited and read the book to all of the 2nd graders. Thanks to a generous donation from the Franciscan Physicians Network, the Rotary Club was able to offer a fantastic incentive to our Andy & Elmer Literacy Project during our reading of the Apple Dumpling Adventure to 3rd grade classrooms in Michigan City. Classrooms were invited to submit posters showing what the 4 Way Test means to them, and our club's Rotarians took a vote for the winning poster. Congratulations to our winner, Ms. Macke from Joy Elementary School! Her classroom wins a $250 grant for supplies for the classroom AND a pizza party, and Joy School will receive a matching grant. Thank you to those who submitted posters! 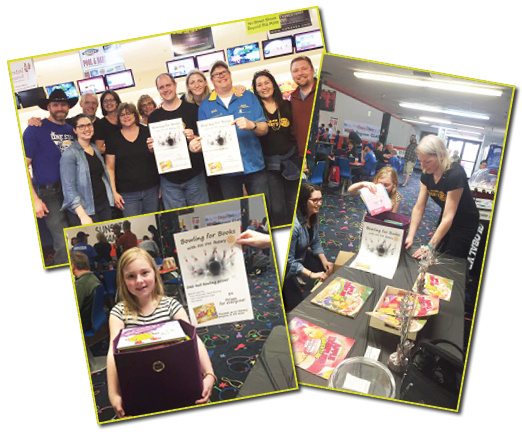 The Fargo-Moorhead PM Rotary Club members hosted the first Bowling for Books fundraiser at Sunset Lanes in Moorhead, MN to raise money for our Andy & Elmer Literacy Project. Back in July, CHARISM held a Summer Camp in McCormick Park and had the opportunity to partner with the local FM PM Rotary Club for a fun unit on ethical entrepreneurship. The students week began with reading a story about two neighbors, Andy and Elmer, and their path to starting a small business selling apple dumplings. Throughout their journey, Andy and Elmer are faced with several decisions about how to run their company and use the 4-Way Test in order to choose the path that is ethical. After learning about the 4-Way Test, students got the chance to create and build “mock” apple dumpling businesses on their own. In small groups, students developed a logo for their company and designed and engineered an apple-picking machine that can pick up to 100 apples per minute. Students finished the week by baking their own apple dumplings with their new friends from the FM PM Rotary Club and enjoying a picnic with the finished products! It was so fun to see their creativity and how much thought they put into their machine design. We are so grateful for organizations like FM PM Rotary Club to partner with to make these opportunities available to the children in CHARISM’s neighborhood. 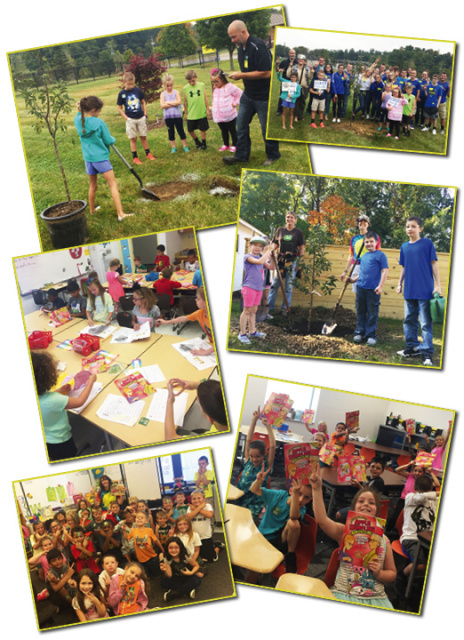 The Boswell Rotary recently completed the Andy and Elmer Apple Dumpling Literacy project at Boswell Elementary. There's a recipe at the back of the book for apple dumplings that we prepared to give the kids after reading and discussing the book. Thanks to our volunteers for their help too! 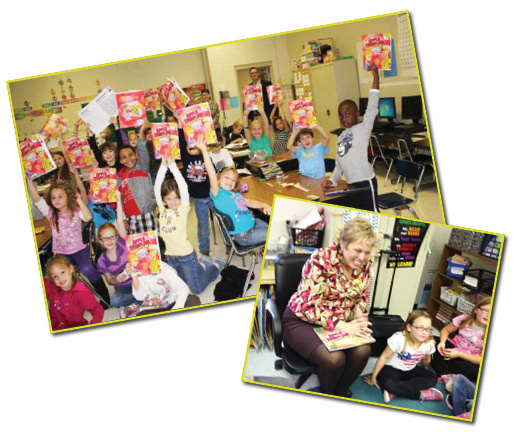 The Martinsburg Rotary Club distributed 1,500 coloring books to every second-grade student in Berkeley County. Martinsburg Rotarian, Sandy Hamilton, reads Andy and Elmer's Apple Dumpling Adventure to students at Valley View Elementary School. 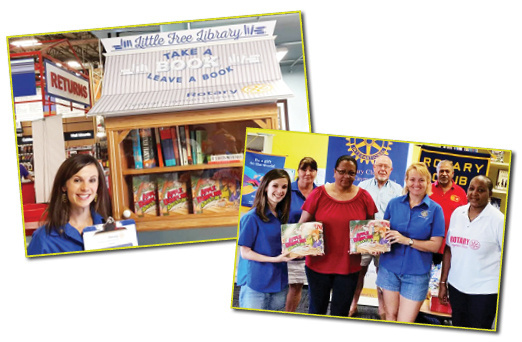 The Rotary Club of Grand Cayman Central Hosted a Little Free Library and used "Andy & Elmer's Apple Dumpling Adventure." 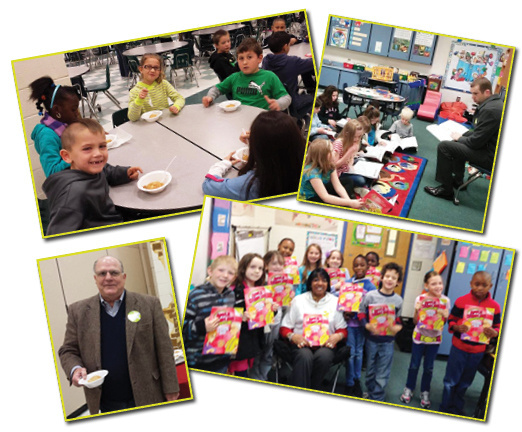 The Rotary Club of Goose Creek brought the Andy & Elmer Literacy Project to second graders and stayed to have apple dumplings. 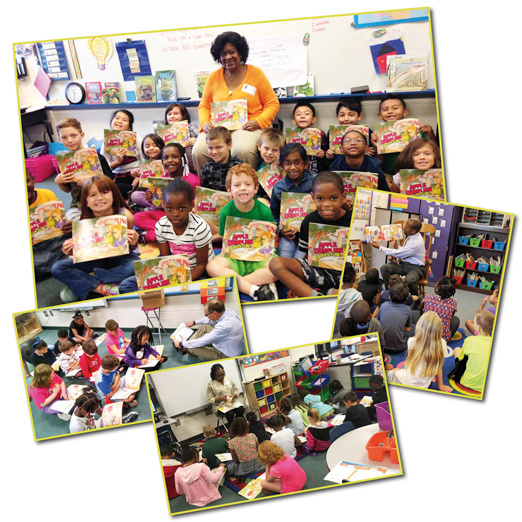 It is being read to approximately 500 students at 4 elementary schools in Berkeley County, South Carolina. 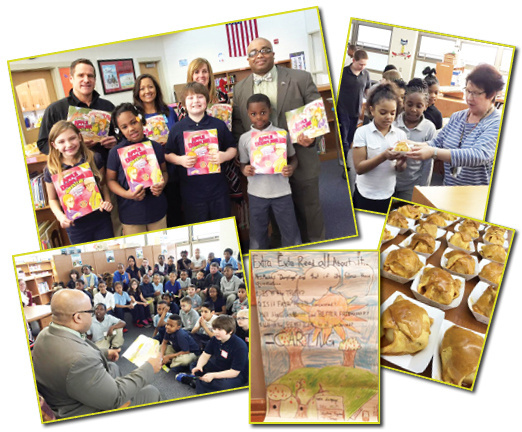 Kids receive "Andy & Elmer's Apple Dumpling Adventure" books from the Rotary Club of Trenton. "I personally met Andrew at the 2010 International Convention in Montreal. He gave me an autographed starter kit. I presented the program to our Rotary Board AND school officials and all were on board with the program. We have been doing the A&E program since 2010 and the teachers LOVE it!! When I knew our club was on board with the Andy & Elmer project, I approached Andy for his apple dumpling donation(s). Each year, when the teachers have finished with the Adventure, all the children adjourn to the school cafeteria and enjoy warm apple dumplings. Some of the students, we have found, have never, ever had an apple dumpling! Early on, Orrville Rotary Club presented Mr. Hamsher with his own Andy & Elmer book which he is most proud of and prominently displays in his office. Our club decided to do the Andy & Elmer project instead of our usual Four Way Speech contest, which reached only a few high schoolers, even though our cash prizes to the top 3 winners was, for our small club, substantial. We felt that the benefits to local teachers and their Character education week was a strong and positive statement. Additionally, when the program is finished and the students take their workbooks and bookmarks home, other family - especially adults - become aware of Rotary's Four Way Test and how it becomes a guide for decisions in all walks of life. Our entire club sends greetings and wishing you and the Fairborn Rotary Club continued success with your wonderfully creative, inspiring and awesome Apple Dumpling program." "The Rotary Club of Madison County, GA has read 'Andy & Elmers’s Apple Dumpling Adventure' to all first graders for the second year. During our first year visit we presented each Media Center with a copy of this book. The school principals have told us that this book and live presentation fits in nicely with their unit study on ethics. We have been invited to return annually. The Rotary Club of Madison County has been using copies of the 'Andy and Elmer’s Apple Dumpling Adventure' as a gift for our visiting guest speakers for over 5 years. We ask our speaker to read the story to young children and perhaps give the book to one of them. Yours in Rotary Service for World Peace." "Here are some pictures from our Apple Dumpling Project a few years ago. The culinary arts program at our local high school made apple dumplings for all of the 3rd graders that we read to. They used the recipe directly from the book and the kids loved them. We have now read your book to over 2500 3rd grade students. I'm more than willing to endorse you and the book in any way. just let me know how I can help." “I would like to bring you up-to-date on what has been occurring on the Andy & Elmer project presentation that I have taken on since I last contacted you in August. I have been presenting to clubs in our area, with a tremendous response, and hope that they will be contacting you soon on their project. In August it was brought to my attention that our club could apply for a Rotary International Vocational Service Project Award, which I think has never been done from our club. So I asked for an application and put together all the information that I could and submitted the application to RI in early August 2010. The application consisted of questions on: What was the primary objective of the project, benefits of the project, description of the project from beginning to end, groups, organizations or agencies that worked with the project objectives, and why this project should be given an RI Vocational Service Award, and this all had to be done in 500 words or less. This was difficult for me to limit this to only 500 words, because of the passion, purpose and the enthusiasm that I have for this project. I just returned from attending our District 6080 Conference in Columbia, MO last week, and was extremely honored to receive the Rotary International Model Vocational Service Project Award presented to the Willow Springs Rotary Club for submitting the Andy & Elmer project. This submission form was available to all Rotary International Rotary Clubs who successfully completed vocational service projects during the 2009-2010 year. As you might guess, I was overwhelmed to accept the honor. The past District Governor for 2009-2010 , Steve Montgomery, which presented this award, remarked that he now has 3 additional clubs that will be taking on this project for the coming year. Rotary is making a difference and I strongly feel that the literacy vocational project, Andy & Elmer the 4-way test, is a #1 way to integrate this into the schools. In whatever profession, trade, career, or vocation that these students choose, the 4-way test will be built into their moral and ethical structure and character, thanks to Rotary. “The students were so thrilled when they heard that the book and the 4-Way Test Bookmark was for them to take home and put into practice, that they could not write their name on the book fast enough. They probably don’t have many books at home, and it was so wonderful for them to be able to take such a beautiful book and story home with them. "We have been doing this project for a number of years here on the island of Maui and our lesson plan is on your website. We just completed it this year." "I just wanted you to know that Rotary Club of Kihei Sunrise has implemented the Andy & Elmer program at 2 Elementary Schools here in Kihei, Maui. And we absolutely love it and thank you for putting this together and sharing it with our Rotary community. Having taught regular education, special ed and gifted kids for several years, I surmised after our first year of presenting to 2nd graders, that the curriculum fit more appropriately in 3rd grade. My reasoning? We started the program in September/October in 2nd grade initially. These cherubs are 7--barely--and with what I know about their cognition, it was evident not all the 7 year olds had yet reached the age of reason, making the concepts we were teaching problematic. In fact, I'd venture a guess that at least half of them didn't understand everything at the level we wanted them to and "getting it" was simply not possible with their brain development. By 3rd grade, they've all turned that cognitive corner and can fully understand all the 4 Way test concepts; newly minted (or even later in the year) 2nd graders simply couldn't grasp this. The difference is startling--their questions are more appropriate and they have more and deeper vocabulary experiences to relate to in the story. They get it much faster--all of the students, they can relate our 4 way test to other parts of their lives at a deeper level and the teachers reported that this seemed more appropriate as well. And additionally for the teachers--we could deliver the lesson in 20-25 minutes vs 30-40, a time-on-task bonus allowing less intrusion into the day's schedule. We added one activity which seemed to be received with gusto. We gave envelopes to the teacher for each student with our club logo on it and asked her to implement this: For 1 or 2 weeks, with our Rotary tenets or poster on the wall, students were to write down on a slip of paper any time they did something that fell within the 4 way test and put this in the envelope. At the end of the designated time, the teacher or her aide would count the number of positive behaviors each one had--the winner to receive a McDonalds gift card we left with the teacher. A good followup activity to relate Rotary ovalues into the classroom. Once again, Mahalo for the good work you do. I would encourage you to try the program in 3rd grade and would love to hear from you on the differences you encounter." "I was first made aware of your literacy project when I visited your booth at an RI Convention...can't remember if it was LA or Salt Lake City. Soon after that I was District Governor and I brought information on this project to all 55 clubs in our district as I made my official club visit. Several clubs ordered books! My club has orderd books several times and used this tool in after-school programs. We have pictures of the kids engaged in the projects and making the apple dumplings! It has been a big hit! I personally have ordered books for children in my family." I am a big fan of this project! "We love this project. Our board just voted to add this project and we will be putting a committee together to get this going. I received my kit and showed it and it was unanimous that we should use this in our community. Thank you and hopefully we will be ordering our books in the not too distant future. (When we reach our financial goal). Thanks again." "Willow Springs Rotary completed their 1st Andy & Elmer project last January 2010. We so enjoyed presenting this project to the Club and introducing this to the Willow Springs Missouri 2nd graders, that I would like to introduce this project to other Rotary Clubs in our area. We will be continuing this project again this coming year in our Club also." “First of all I want to extend a thank you from me and all my fellow Rotarians in Mechanicsburg North Rotary Club. One of of our club members, Mrs. Marcey Whiteside (ex-principal from elementary and middle school in Mechanicsburg, Pa school district), took the Andy and Elmer’s Apple Dumpling Adventure to 2nd grade classrooms in the school year 2008-2009. Vocabulary development before reading the story, helped with comprehension of the story: I made this into a fun game using visuals. While reading, the use of prediction (and letting the children know that there are no right or wrong answers) really drew the students into the story. Everyone wanted to share their thoughts. After reading and reviewing the story, I explained the activity book to them. When they found out they each would recieve a copy, they were sooooo.... excited. Some asked several times if they really could keep it. Included in the activity book was a copy of the recipe (which is not in the activity book) from the hardback book. Many students talked about having an adult help them make the dumplings. One of the teachers actually had the class make apple dumplings following Andy and Elmer’s recipe. “The kids were just great. They were all so interested in sharing answers to my questions. I had a lot of questions that I asked to engage them in the lesson. I asked them for examples of each of the Four-Way Test questions, and they were overflowing with answers. I tried to use questions they might encounter in school. How many of you have seen something unfair on the playground? I made up some examples of bad decisions about copying someone else’s homework, and then asked if that was fair to all concerned. Why or why not? It was such fun and so easy to engage them in conversations. There was one little girl in each class who did not volunteer to answer any questions. One was the only girl of color, the other was educationally challenged. I made a point of asking them to answer an easy question when they didn’t volunteer. That made them smile like everyone else! “The kids loved answering questions and just discussing the story. I was glad I allotted enough time for that. They were incredibly insightful and loved to share their thought/predictions during and after the story. The lesson plan given to us was excellent. “I added a “Fast Hand” game recommended by my daughter who is a second grade teacher. I went through the words and definition/descriptions by playing a game with M&M’s, where I held up a card. The first person who raised a hand and could read the word and use it in a sentence got an M&M. This got everyone very involved. “We approached the Wayne-Westland School District Superintendent to see if Andy & Elmer would be something the district would be interested in (18,000 student k-12). Nothing worse that a gift that the recipient doesn’t want. It was reviewed by the district media services director and he wrote a “review” that I have attached. (See below.) We made a presentation at an elementary principals’ meeting at which the Asst. Super for Curr. endorsed Rotary and our Rotary club in particular for asking if we could be of assistance and paying for everything that we supported. “Andy & Elmer’s Apple Dumpling Adventure is a picture book suitable for early elementary students (library cataloging information recommends grades 1-4). The main character, Andy, learns about the virtues of truthfulness, fairness, goodwill, and partnerships that benefit everyone involved as he begins his own apple dumpling business. The lessons illustrated through the story of Andy’s entry into business are easily accessible. The color illustrations are well done and the characters are created in a style similar to graphic novels, which appeals to young readers. 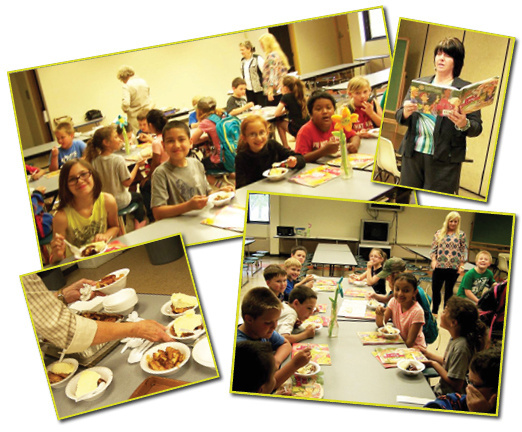 Students will enjoy the recipe for apple dumplings at the end of the book. Students could rewrite the story with an outcome they think might happen if Andy had responded differently to one of the questions posed by the voice he heard. Making apple dumplings would give opportunities for students to work together cooperatively in an activity that would certainly engage them. There are obvious connections to math in the measuring process for ingredients, ratios, fractions, addition, subtraction, sales, percentages, etc. and could be lead-ins to activities using math tools and software. Following a formula to cook the dumplings is a great introduction to the scientific process and could lead to a variety of science activities that require step by step procedures. “At the beginning of the year our District Governor, Wyn Spiller, gave each club in our District the objective of creating an Ethics and Literacy Project/Program for our local students. Our club took this to heart and we began searching for a way to promote an ethics and literacy program to our local students. My wife Ann, a Rotarian also and our web-master, was looking through the RI web-site and happened upon The Apple Dumpling Adventure Book. She looked at the book and encouraged me to take a look also. After reviewing the book it became apparent to me that the Apple Dumpling Adventure Book would be perfect to not only promote literacy but to also promote ethics in our youth by promoting the Four-Way Test. I contacted our local Principal at C. Roy Carmichael Elementary School and asked him to review the book to see if he would allow us to present the book to his entire second grade class. The Principal reviewed the book and was very impressed about the message and agreed to the presentation. On January 12, 2009 several Rotarians presented Apple Dumpling Adventure Books to forty 2nd graders. The book was a big hit with the kids! On January 21, 2009 the article and picture appeared on the front page of our local paper, The Portola Recorder. The article and picture will also be in our local adjacent paper, The Sierra Booster later this week. As a footnote, the local school Principal was so impressed with our dedication to the youth of our community that he joined Rotary. Another footnote. At our last Rotary meeting our program presenters were from another club in our District (the 49’er Breakfast Club of Nevada City, California). They were so impressed by our Apple Dumpling Project that they took a copy of the book back to their club to see if they wanted to do something similar. “I am Anna Rybak, a member of the Rotary club of Park Ridge Illinois, who has currently completed this year's literacy project, The Four-Way Test—Andy & Elmers Apple Dumpling Adventure. The literacy project involved 8 Rotarians and 2 non-Rotarians. These volunteers presented the project to all of the 2nd graders in five schools in our District 64, approximately 500 students. I believe the students understood the message on how important it is to live each day by the Four-Way Test through the things we think, say and do. The teachers also stressed to their classes the comparison between civil behavior and the Four-Way Test. During the reading of the book Andy & Elmers Apple Dumpling Adventure, the children were all attentive and enjoyed the story. They were very excited to receive the coloring/activity book and bookmark. It was a fun and rewarding project that I would consider doing again.